If you like taking your dog/s for long walks in the forest and countryside or off the beaten track, you may be worried and surprised to learn that there is a very serious disease that dogs are contracting from walking out in country areas. The inference is that muddy and boggy areas could be harbouring this disease. Please share this post with those you know have dogs, it is vital that all dog owners know about this devastating disease and by sharing you may save lives. There is little known about the infection except it is thought to have first been identified in greyhounds in the state of Alabama during the 1980s. There weren’t that many cases and as numbers contracting the disease seemed to dwindle, nothing much was done and research into the disease was put on the back burner. 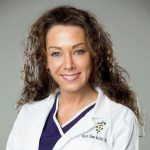 Officially known as CRGV (Cutaneous and renal glomerular vasculopathy) as well as Alabama Rot, this disease causes damage to blood vessels of the skin and also damage to the kidneys. But now it has reared its ugly head within the UK since 2012 and although only 102 cases have been confirmed, with another 57 suspected, the disease is often fatal, the cause of death being due to kidney failure. Because it is a little known disease, it is often diagnosed too late for the hapless canine. Luckily it does seem that it is not crossing the species barrier with other pets like cats and rabbits seemingly unaffected. The New Forest in Hampshire, UK has so far taken the brunt of this horrid disease but now it has spread to other areas, including Devon, Dorset, Monmoushire, Cheshire Worcestershire, Warwickshire and the Greater Manchester areas and now it appears that Cornwall has been hit. Which areas are most dangerous? There is much speculation as to where this disease lingers with specific areas of the countryside not yet being identified as dangerous. The Forestry Commission, does remind dog owners though, that the numbers struck by the condition are very few. But this is no consolation to those who have had their dog succumb to the illness or know of a neighbour or someone in their area who has lost their beloved pet. So if we don’t know exactly what causes the disease and what places to avoid, what can we do to protect our dogs? We have got a few clues with the majority of the outbreaks happening between the months of November and June. This would indicate that the problem may occur more in the wettest part of the year ie. the Winter and Spring. 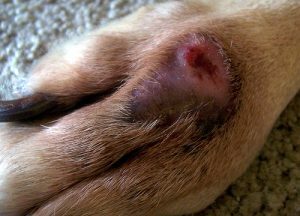 The infected dog seems to suffer from lesions and sores on the lower parts of the legs and sometimes the stomach and face area which again could indicate some sort of condition due to mud or walking and running through muddy water, slurry or waterlogged areas. 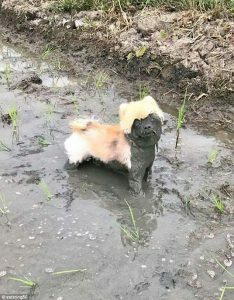 It is advised that any mud and dirt on the dog be washed off as soon as possible. Apart from being on the alert for stagnant, boggy and muddy areas, putting your dog on the lead through these regions or perhaps avoiding them altogether, could be a good idea. 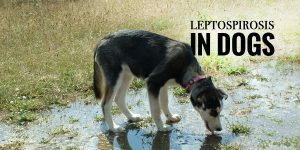 This practice may also avoid leptospirosis which is thought to be contracted from drinking from stagnant ponds and dirty water. The Leptospirosis vaccine given to those dogs susceptible to the disease has poor efficacy and also contains mercury. Our two pups both had a serious reaction from this vaccine when our vet gave it to them without asking us first. Given the option, we would have refused this non core vaccine. It would appear that this particular vaccine causes some serious side effects and the fact that BOTH our pups had a serious reaction would confirm this fact. This vaccine contains a powerful adjuvant that triggers a strong immune system response and carries a much greater risk for adverse reactions than other vaccines. Leptospirosis can be treated if detected early, so be on the alert. If a lepto infection is entirely treatable, why vaccinate? My answer is – follow the money! The first signs of Alabama Rot is lesions, swelling, sores or red areas on the legs, feet, stomach or face. If you know your dog has not been injured, be suspicious and get the dog checked immediately. Your dog may also lose hair and/or lick the affected area. If these symptoms are not spotted, your dog will show outward signs of kidney failure ie. depression, lack of appetite and vomiting and the kidneys could be seriously damaged. It would appear that as many as 90% of those infected succumb to this disease. It is always a good idea to get into the habit of checking your dog over when you’ve finished your walk anyway. 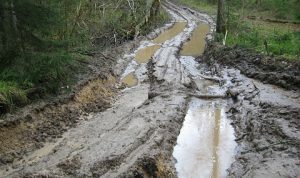 After cleaning off any mud and muck, look for lumps and bumps, sore areas, cuts and injuries. Dogs can get injured without you knowing, they are brave creatures and will not make too much of a fuss if they are hurt. If your dog starts licking himself more than usual, check out the area. Watch your dog for signs of listlessness or acting out of character. The British Environment Agency has ruled out chemical contamination and experts do believe that this disease is similar to Alabama Rot, hence the name being bandied about. 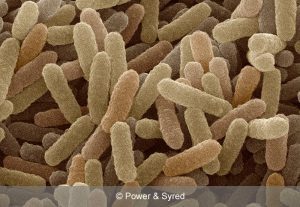 Despite a lack of evidence it is thought that a toxin produced by the E. Coli bacteria could be the culprit. More research is called for to confirm exactly what is causing this lethal infection. Although I sometimes digress from the subject of this site as I have with this post, I like to remind all of us about Magnesium’s benefits. That includes the benefits this vital mineral gives our beloved pets. Putting a few drops of Mg Chloride solution in your dog’s water will keep him in fine fettle. Or you could also use a sprinkle of tasteless Mg citrate powder on his food. As well as us, animals can also suffer from a lack of Mg and this will have a direct affect on their wellbeing. If your pets are fit and healthy, they will be less likely to succumb to diseases. A healthy immune system will protect your precious pets against pathogens. It is always amazing to me how farmers know how to treat their animals against Mg deficiency but doctors have no idea what to do to keep us humans replete in this essential mineral. Maybe it’s something to do with money? If a farmer loses his animals because of a Mg deficiency, he will lose money, so he will supplement his animals’ food with Mg. If a doctor sees a patient who is sick because of a Mg deficiency he will not be giving a Mg supplement. Instead he will prescribe a drug which will make him and the pharmaceutical company money and will likely result in the patient’s dependency on that drug for life. I wonder how many pharmaceutical drugs actually cure an illness rather than control it… or dare I say, make it worse? Despite ‘Alabama Rot’ being quite a rare disease, please be aware and check your dog isn’t getting into muddy and mucky areas. Put your dog on the lead to avoid boggy paths, stagnant ponds and muddy tracks. Shower off any mud and dirt as soon as you return home. Don’t hesitate going to your vet if you are suspicious about anything, better safe than sorry. Keep your dog fit with good quality foods with no wheat or artificial additives and only natural ingredients. Change his water frequently and add a few drops of Mg Chloride to it and/or Mg citrate powder to his food. Our precious pets are part of our family and we must do our best to keep them healthy, happy and content just like we do for all our other family members. Please don’t forget to share this post, it could save the life of a precious pet. This article is extremely interesting and informative. I am very happy I came across it. When I read the heading “What is Alabama Rot” I was immediately intrigued because I thought it was the state of Alabama in the US. I have an 89lb Airedale Terrier who I walk on a lead every day for 3 miles. Earlier this spring while at his annual check up, he tested positive for Leptospirosis. I was told it was similar to lyme disease but more serious. After one month of meds he was cured. I totally agree with your comments about doctors and the pharmaceutical companies and have experienced this first hand. I am definitely purchasing Mg chloride solution to add to Jack’s water bowl each day after reading this. Could you share how much Magnesium you take yourself on a daily basis? I’d like to start this as well. On a side note, I read your post on Monsanto and Cancer. Loved it. I’ve published a blog on Monsanto and Roundup and the vanishing of our honeybees here in the states. I’ve bookmarked your site so I can share it with others. Hi Karen and thanks for your comments. I’m sorry to hear about your lovely Airedale (they are super dogs) but relieved to learn he is now fine. This just goes to prove that the Lepto vaccine is not necessary and just gives your dog an overload of mercury and other toxins. Being a responsible owner as you obviously are, will also protect your precious pet. 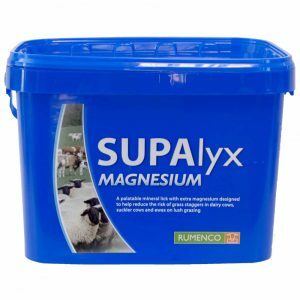 As for Mg supplementation have a look at What is Magnesium Chloride? . This will give you all the facts about this vital mineral. As for me personally, for my body, I have sussed out that I need around 600-700mg of elemental Mg. I put 2 teaspoonfuls of the Mg Chloride solution (10ml) into a one litre glass jug and fill it to the top with water. I then drink this slowly throughout the day. This also ensures I keep hydrated. I also top up by using a little dropper bottle that holds about 50ml of the solution and put a few drops in my tea and coffee throughout the day, good for taking out to restaurants and on holiday as well. The more you spread it, the better it works. I’d like to read your blog on Monsanto and Cancer, what’s your site address? I was doing some research on the infection my dog has by his ear, and saw your headline for Alabama Rot. 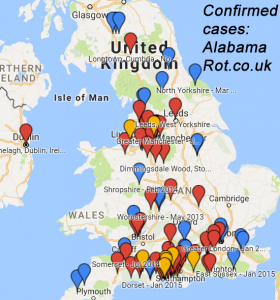 Alabama Rot sounds like a horrible infection. Thankfully I don’t think that is what we are dealing with. After reading your post, I am once again reminded that a healthy immune system is the answer to so many of life’s ailments. I am still trying to wrap my head around how important magnesium is to our health. I really had no idea that it was as crucial for animals as it is for humans. I take a magnesium supplement daily for a stronger immune system. I think I will take your advice and make a visit to the vet. Thanks for sharing. Hi Steve & Kris, I’m relieved that your dog seems OK but a trip to the vet will make sure. As for magnesium, not only is it vital for all animals and humans, it’s also the basis of plant growth, I expect you’ve heard of chlorophyll. Without magnesium chlorophyll cannot capture the sun’s energy needed for photosynthesis. The reason leaves loose their green colour in Autumn? Magnesium is being reabsorbed into the plant/tree ready to arise again in the spring. I am so pleased you are supplementing with magnesium regularly. Please make sure it has high bio availability such as Mg Chloride or Mg Citrate. Mg Oxide is at most only 4% bio available and that is usually what the pharmaceuticals put into cheap vitamin and mineral supplements. Good for constipation though ’cause it goes straight through you! Very interesting article! Although I don’t interact with many dogs, I will be sharing this with all of my friends who own dogs/are dog-lovers! What a mysterious and weird disease. I agree that the best mode of preventing any disease/infection by bolstering the immune system. Magnesium supplements surely are a vital component to maintaining a healthy immune system. I would like to try adding some to my cat’s water (as well as mine!). Do you personally feel a difference after taking these supplements? Hi Ciara and thanks for reading the article and sharing with your friends who have dogs. As for your question, it is an understatement that I feel a difference after taking this vital mineral. It has cured: my insomnia, sciatica, back pain from muscle spasms, constipation, depression, anxiety, headaches, eye and facial twitches (a common symptom of Mg deficiency), heart arrhythmias (my heartrate is now 60bpm), fatigue and brain fog. This is apart from my stress levels. I don’t get stressed out any more and can cope with everything life throws at me. I am now a happy, calm and switched on woman. Despite my age, I don’t take any medication whatsoever. This is truly a magical mineral. If everyone was replete in magnesium half the hospitals would be empty and our doctors’ work loads would be halved! Being a dog lover myself, I found your article very interesting. I myself have never heard of this disease and it seems to be quite serious even though its rare. I do not own a dog at the moment but am thinking of getting on in the future. When I do I’ll be sure to check them after each walk to make sure there are no sores or symptoms of this disease starting on them. Thank you Michael and please spread the word to all your dog loving friends. You could save a life doing so. This is really helpful. I never even heard of this disease but it seems pretty serious since it can damage the blood vessels and the kidneys. I love taking my dog out to the field and just letting him sniff around the grass and the trees. But now I need to be more cautious because I would hate for anything that serious to happen to my dog. Great article, I’m definitely sharing this on Facebook and looking out for the symptoms. Hi Garrett and thanks for reading the post. Please spread the word to those you know that have dogs. This is a particularly nasty disease and it can be as little as a week before a dog can succumb to kidney failure. It does seem that the dog comes out in a sore but I wonder if the infection gets into an existing small cut or nick that the owner doesn’t realize the dog has and then it gets mud on it. Diligence is the key!